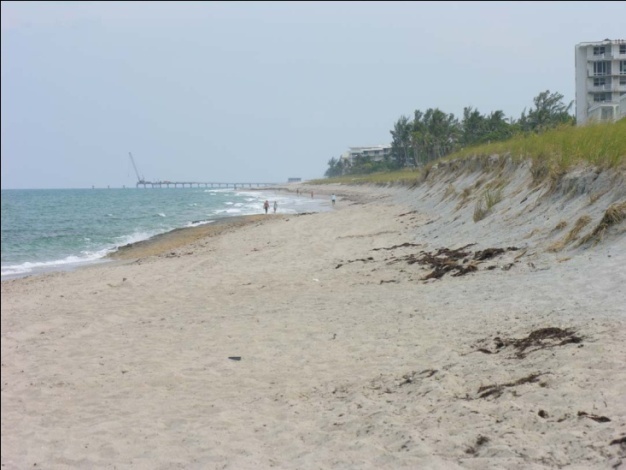 Summary: Erickson Consulting Engineers, Inc. (ECE) was engaged by a coalition of 8 Condominium Associations situated along Reach 7 in the Town of Palm Beach to evaluate the 2-mile beach nourishment project’s performance, identify the primary factors that contributed to beach areas experiencing high sand loss rates. This report recommended actions and solutions to ameliorate the present erosion rates to protect the residences along this two-mile shoreline from future damage from high rates of beach erosion and loss of the protective dune to restore the recreational beaches fronting Phipps Ocean Park’s public beach. This work included an in-depth assessment of the borrow area core logs and sediment compatibility for suitable placement on the beach. ECE prepared and delivered a presentation to the Town’s Shore Protection Board to convey the results of the study. Challenges: The project involved evaluation of borrow areas utilized to evaluate the actual verses permitted design excavation locations to determine the cause of the high sand losses and the redistribution of the fine sediments that characterized the final project. Recommendations for amelioration measures using structures are presently in progress by the Town.